When you grow up in a culture that brands "throwing away food" as a sin, there is both a pro and a con. The pro is of course, you don't waste food and learn to respect it early on. However there is a teeny tiny con to it, particularly when you don the role of cooking the food. More specifically when you are cooking something you have never done before. You cannot proceed with the comforting assurance that "If it doesn't turn out okay, I will throw it away". You cannot afford to perfect your Mayo by flushing away several failed batches like Julia Child did. No missy, you don't throw food. You either make it edible enough and eat it. Or you just eat it. Since, I have been conditioned to live by this principle, many a times I have to ingest a lot of my own food that no one else would touch with enthusiasm. Now, when the aforesaid things are savory dishes, I can often salvage them enough to even like them. Like if a dimer jhol goes wrong, I can add chilli powder or ketchup or chaat masala or something to take the mind totally away from what it should have actually tasted like. I can even convince the family to eat it. All I have to say is "It is different"! But I cannot fool around with desserts. Like say Malpoa. I mean if a Malpoa goes wrong what do I do ? I cannot throw it. So either I have to stuff my face with the goop which has resulted or store it away in the refrigerator to be discovered in late 2016. The goop is not necessarily bad tasting because it has flour and sugar and milk and has been fried in oil. But then again it hasn't turned out to be the "malpoa" you imagined it to be. You cannot serve it on a plate garnished with pale green pistachios. You DO NOT throw it. So mostly I eat it, trying to determine with each bite, what exactly went wrong.And then I feel extremely guilty for eating all that excess sugar. Now, the only reason I am giving away my secrets is to bring things in perspective. To explain, why I try to tread the road most traveled when it comes to desserts. And to ask, how do you go about trying to get a new recipe right without the safety net of -- "It is okay if it doesn't turn out right, I will start over again, meanwhile I will find someone to eat this disaster". 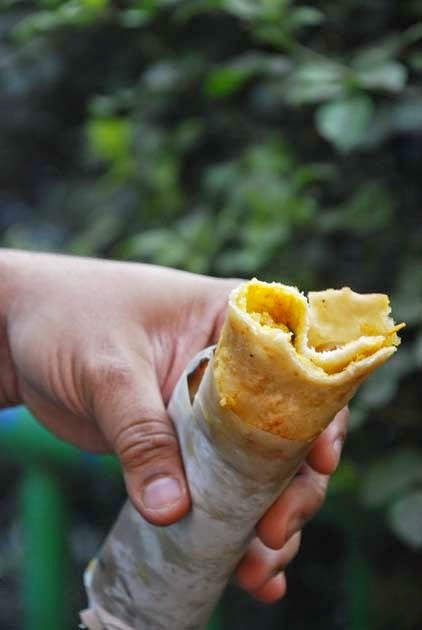 You remember how my friend used to make this amazing Roshgolla and we picked it up from him ? Well I made it a couple of times and the roshogollas came out great. Then since roshogollas are not made every day in my house, after the initial euphoria settled, I made it after a gap of few months. Bam! they didn't come out as expected. The cheese balls were disintegrating in the sugar syrup. Panic attack. I couldn't throw them away!!! I could have made a chhena paayesh of course but was in no mood to do such. I couldn't just dump them all in trash. So glumly I had to eat almost all of those roshogollas which were parting ways in the syrup. And it isn't even my favorite sweet. You understand my pain? You see how all that processed sugar gives me anxiety attacks and acne? The only way to perfect such disasters and to hone your instinct on what might and what might not make the roshogollas split is by practice. But I did not want to eat tons of sugar again. So two conflicting lessons I have grown up on -- Practice makes perfect and Don't waste food --- veered me towards making more roshogollas and eating them until I could make them blindfolded, while my good sense -- Too much sugar is not good for you restrained me from making any more roshogollas. Good sense prevailed. It took me all of six months to erase that memory and venture to make another batch. I had these amazing Khejur Gur er roshogollas during my India trip and my heart wanted more in the freezing winter months. In absence of a "Mahaprabhu Mishtanno Bhandar" down the street I decided to make some Khejur Gur er Roshogolla for Saraswati Pujo this time around. It helped that Little Sis absolutely loves Roshogollas and will eat them with much joy. However I had learned my lesson and was more cautious. 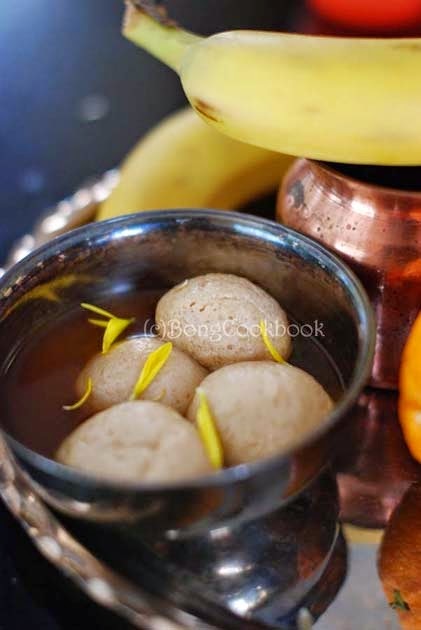 I first tried out only five roshogollas to check that everything was okay with the chhena and it had been indeed kneaded to the right texture. Happy with the result I proceeded to do the rest. Thanks to input from Shakuntala and another friend N, I made the syrup using Khejur Gur. That imparted the sweet smell of palm jaggery in the roshogolla. I also added a tsp of Sooji/Rawa to the chhena while kneading. I felt that ensured slightly firmer roshogollas. If you want sponge roshogollas do not add the sooji though. Everything else was same as before. I have updated the old post with some tips that I have learned along the way, they are under Notes after each Step. I know it is a hard thing but try it. 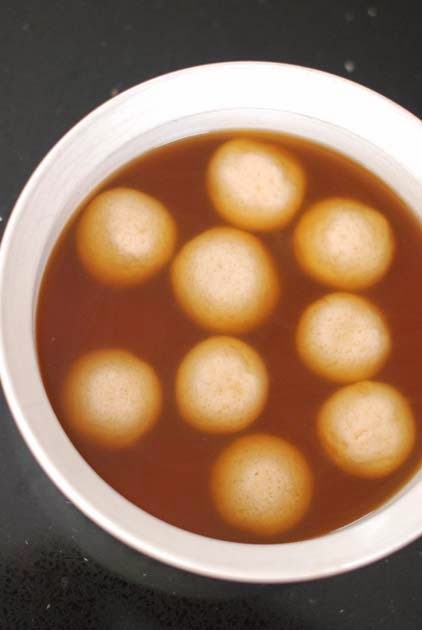 Roshogolla actually is a very easy dessert to make once you have got it right. I would say after kneading the chhana , try only a couple at your first attempt. If it doesn't turn out okay, knead the chhana again. The chhana should not be sticking to your palm or fingers when it has been kneaded right. At least that is what I understood. If the next few doesn't turn out okay either, use chhana to make chhanar dalna and then start over again. I would really love to know what do you do when a new recipe you are trying doesn't go right. Do you throw it and start over or do you try to make it more palatable? It has been a while that I have logged in here and I am glad that I haven't forgotten my password!!! It has been so long that it feels like I blogged in my other life or something. But if I tell you all that I did since November, you will know that there was a worthy reason for all that absence. In November we went to India for a three week vacation. Now, that itself is big enough, given we were traveling with two kids, who had neither valid visa nor passport, a fact we were oblivious of until we decided to book the tickets, which incidentally was about 10 days before the travel date. You see the dependency in there ? The multiple critical paths ?A slip at any point and we would not be going anywhere. But it did not slip. Thankfully. Then we came back, right in time for the Christmas holidays, and so had to rush around getting the Christmas tree up and then buying at least a few presents for the kids if only to re-instill Little S's faith in Santa Claus. Throw in a birthday party for Big Sis where seven of her friends came over one evening to make their own pizza, sundae and to generally have fun. The girls were self sufficient and I hope had fun though Big Sis was vehement about not having a party this year. We had one more party on the 24th, where I made only the appetizers and catered the main food. I made a roast pork in the oven which was really good and wanted to note down the recipe, which involved marinating the pork in roasted Indian spices and was kind of free flowing, but never got the time to do so. Next time, I guess. Then my sis-in-law was visiting with her family and we did the usual Rockefeller tree visiting on Christmas day braving the insane city traffic for about 2 hours, before our car could land up anywhere near the tree. Next the whole family went to watch PK where, you wouldn't believe this, two back-to-back shows were all sold out. We had to go back the next day for a showing!!! Some perseverance. Soon after sis-in-law left we drove across neighboring states to spend the New Year with another friend. Finally when we were back on the 3rd, endless days of school and work seemed more relaxing than the break we had. So, you see, in this whole rigmarole, it is a miracle that I still managed to remember my blogger password. I had originally intended to do the New Year post about a chocolate cake that BS had made for her birthday and whose recipe was given by my niece R, a dear friend's daughter. But out trip back home was so much fun this time that I thought of writing at least a little about it, along with a few pictures in this post. I think after many years, this was a trip, when I ventured out of the home most and also ate out a lot. The second is definitely a difficult task to achieve, given our short stay and the home cooked food that my Ma and Ma-in-law wants to feed us but I persevered and managed to sample a lot of the old favorites. 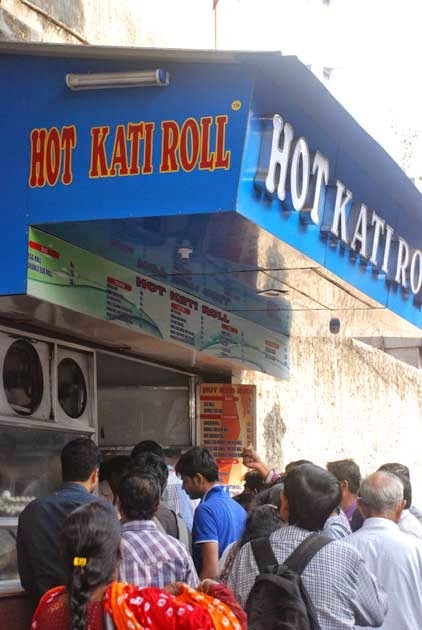 The day after we arrived, we were at Park Street to get some personal work done, and of course I had to visit Hot Kati Roll. The small store was packed as it was around lunch time and the owner was visibly irritated with my attempt at photography. The egg-chicken roll however was not what it used to be and left me a bit disappointed and at the same time happy that I was not missing out on anything in the US. 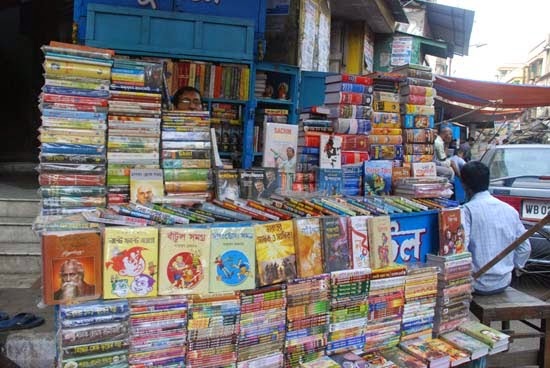 From Park Street, we went straight to College Street to buy our stash of Bangla books, Amar Chitra Kathas and Enid Blytons. 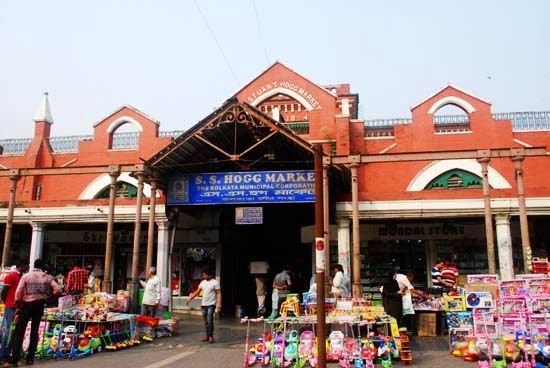 I know, I know, Starmark or Crossword is the place these days but a trip back home without going to College Street is incomplete for me. Since on my last visit we had done the Coffee House, this time I decided to skip it. Also we had landed just the day before and I had already consumed an egg roll. For old times sake, I walked around college Square to get a glimpse of Paramount. Again was a bit skeptical of going in and I opted for a fresh daab er jwol from the roadside. See, what age and staying outside the country has done to me. I am ashamed of myself. However the sadness of not eating a kobiraji or drinking a chocolate malai sherbet was swept away by the sight of books jumping out of every bend and corner. If I had to define "happy" at that point, it would be to roam College street with the sole aim of buying books of fiction for pure pleasure. No tension of shouting for a Maiti-Ghosh or Tannenbaum. What relief. 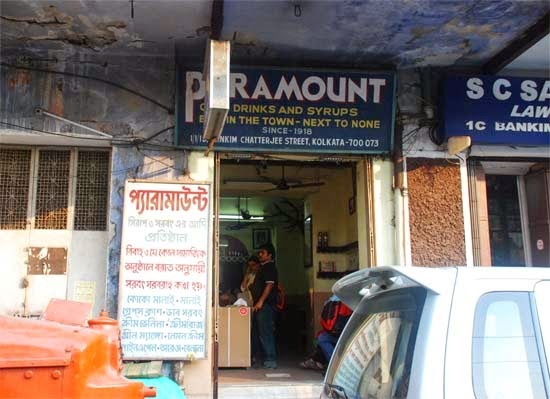 After strolling a bit, I went to the old trusted bookstore of Dasgupta & Co., where a chai-wallah had come with his huge aluminum kettle and stack of earthen cups to deliver the bikel er cha. I started so longingly at the khuris(terracotta tea cups) that the the book sellers finally relented and offered me a cup. 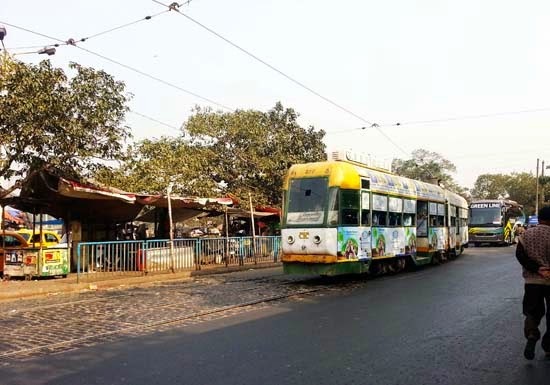 After a cup of tea, Lila Majumdar Rachanaboli, and "Aro Satyajit" we were out to face the booksellers on the pavement shouting out "Didi, ki boi chai, ki boi?" It is such a warm, fuzzy feeling to be in a street where all people ask is which book you want. The next day, was at Flury's with the whole family. My dad felt it was a place fit for his grand daughters and so wanted to treat them there. Around noon, it was totally empty and the servers hovered around us constantly which made me feel a tad nervous as I like to be left alone when I am making up my mind about what to eat and then actually eating it. But they were only doing there job with too much enthusiasm and I shouldn't blame them for that. The ladies at the pastry counter were opposite of enthusiastic though and I figured had not much idea as I asked about the various kinds and the differences between two very similar ones. The girls thoroughly enjoyed their pastries and ordered a pasta which they loved. 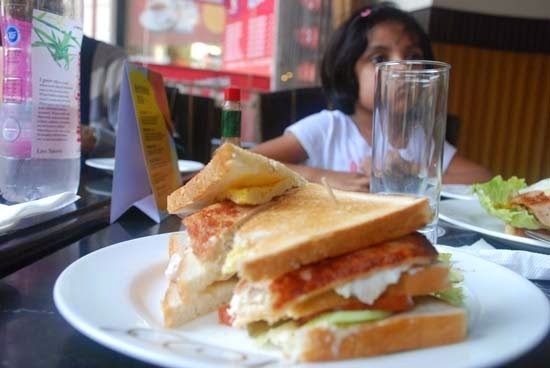 My club sandwich was totally delicious and I will forgive the over zealous servers for it. 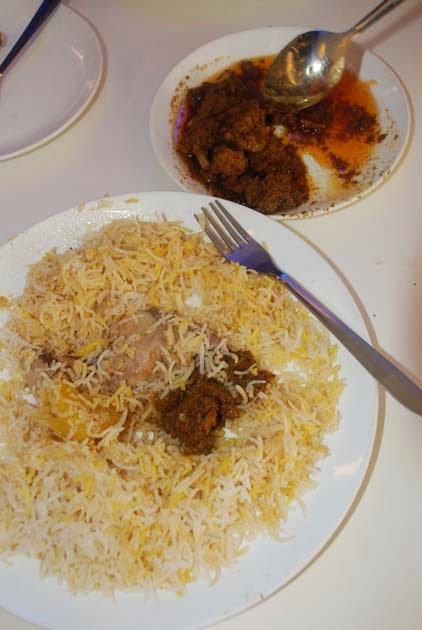 Our Biriyani quest started with Aminia, the one at New Town, and it went down with a whimper. Next since everyone was raving about Arsalan, we decided to give it a try too. I had never heard of Arsalan before so it was a brave move. I thought the biriyani was good but the pieces of meat in the Biriyani was really disappointing. Also in the US, we get really good Hyderabadi Biriyanis and again I felt that I wasn't really missing much. All that changed of course, the moment we walked into Shiraz. The fragrance itself put me in place. It was 11 in the morning. I was there after a full breakfast of luchi-torkari and yet my heart trembled with what was to come. We ordered a Biriyani, mutton chaanp and roomali ruti. My words fail me at what I felt at the first spoonful of the Biriyani. The roomali roti, soft as cloud was like a whiff of warm air in our mouth enveloping the soft morsels of meat in the chaanp. The tender meat seemed to have cooked in the spices for a relaxingly long time to achieve that perfect taste. I hate to admit but the chaanp that I had attempted at home was not even a distant cousin of this miracle. The 2 hour gap was not enough to induce hunger and only a single plate of chelo kabab was ordered to be shared by D and me. The taste was exactly like I remembered, the rice moist and rich with butter and a poached egg on top, and the succulent kababs. 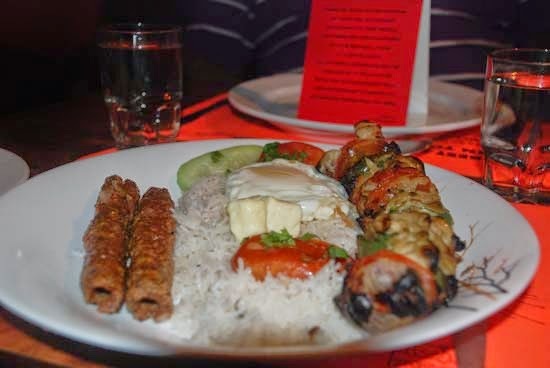 I don't care much for the chicken kababs but the buttery rice and the skewered lamb kabab is out of the world. 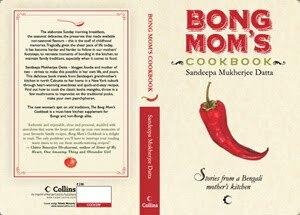 I have to get the recipe of a chelo kabab and try to make it at home soon or I could just eat generously buttered rice. I think the second option will make me equally happy. And then of course there was Oh!Calcutta. I had decided that come what may I would make sure to visit the restaurant on this trip. So even when folks on FB suggested Bhojohori Manna or some other place, I went ahead to Oh!Calcutta with a steely determination. 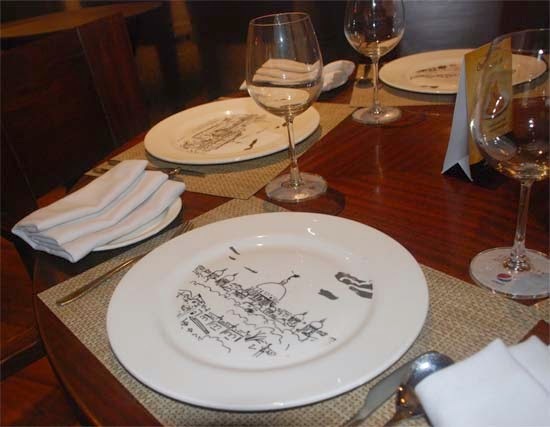 The ambiance was excellent and I was really happy to see apun ka Bengali food being served in such an atmosphere. However US has spoiled us and being used to large portions of food in restaurants , I was bit taken aback by the small portions. The price too I felt was exorbitant given the portions. The food was good if not great and loved the fried boris they served along with myriad chutneys. Little Sis loved her plate of bhaja with Gobindobhog bhaat. The Gondhoraj Bhetki too was delicious. We also had daab chingri, railway mutton curry, kaanchalonka murgi and another bhetki dish. The star was however the Nolen Gur er ice cream, it was totally out of the world and even my parents, who were not impressed by any of the other dishes, agreed that the ice cream was really something.